This exciting collection of new essays suggests ways that cultural analysis can become more socially grounded, while also challenging sociology to learn from analytic perspectives developed outside the discipline. Introduction: Engaging Sociology and Cultural Studies: Disciplinarity and Social Change: Elizabeth Long (Rice University). Part I: Thinking Through Memory and Tradition:. 1. Relativizing Sociology: The Challenge of Cultural Studies: Steven Seidman (State University of New York at Albany). 2. Reading Architecture in the Holocaust Museum: A Method and an Empirical Illustration: Magali Sarfatti Larson (Temple University). 3. Subject Crises and Subject Work: Repositioning DuBois: Jon Cruz (University of California, Santa Barbara). 4. Conserving Cultural Studies: Andres Goodwin and Janet Wolff (University of San Francisco and University of Rochester). Part II: Reframing Popular Forms and Usages:. 5. Monsters and Muppets: The History of Childhood and Techniques of Cultural Analysis: Chandra Mukerji (University of California, San Diego). 6. Rewriting the Pleasure/Danger Dialectic: Tricia Rose (New York University). 7. Situating Television in Everyday Life: Reformulating a Cultural Studies Approach to the Study of Television Use: Ron Lembo (Amherst College). 8. Facing Up to What's Killing Us: Artistic Practice and Grassroots Social Theory: George Lipsitz. Part III: Relating Cultural Processes and Social Inequality:. 9. Colliding Moralities Between Black and White Workers: Michele Lamont (Princeton University). 10. The Ideology of Intensive Mothering: A Cultural Analysis of the Best-Selling 'Gurus' of Appropriate Child-rearing: Sharon Hays (University of Virginia). 11. Mexican American Youth and the Politics of Caring: Angela Valenzuela (Rice University). 12. Jazz Tradition, Institutional Formation, and Cultural Practice: The Canon and the Street as Frameworks for Oppositional Black Cultural Politics: Herman Gray (University of California, Santa Cruz). Part IV: Engaging Disciplinarity and Other Politics of Knowledge:. 13. The Social Construction of "Social Cunstruction": Notes on "Teddy Bear Patriarchy": Michael Schudson (University of California, San Diego). 14. Critical Cultural Studies as One Power/Knowledge Like, Among, and In Engagement with Others: George Marcus (Rice University). 15. The Men We Left Behind Us, or Reading Our Br(others): Narratives Around and About Feminism from White, Leftwing, Academic Men: Judith Newton and Judith Stacey (University of California at Davis and University of Southern California). 16. Re-Inventing Cultural Studies: Remembering for the Best Version: Richard Johnson (Nottingham Trent University). 17. Whither Cultural Studies? : Ellen Messer-Davidow (University of Minnesota). 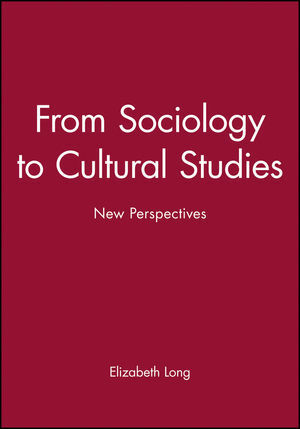 * First collection to address the connections between sociology and cultural studies. * Newly commissioned articles from the most prominent scholars doing work in this area. * Essays combine the empirical and theoretical work to make the link between sociology and the analytical perspectives found outside the discipline.